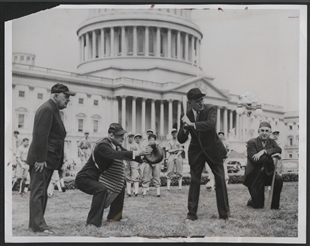 In this photograph, Charles Fletcher is captured with his eyes on the ball, attempting a bunt during training for Congress's 1947 annual outing. 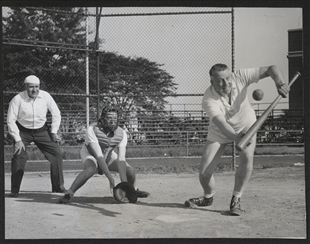 Behind him, catcher Glenn Davis and umpire Harold Hagen stand at the ready. The Republicans' practice must have paid off, as they went on the beat the Democrats 16 to 13 in the game held on July 12th. The win was not without controversy. 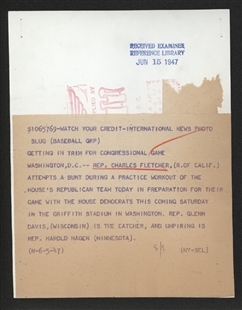 The Democrat team argued that if they had been able to play their last inning, which was cancelled due to rain, the outcome would have been different.